John Wesley (1703-1791) and George Whitefield (1714-1770) were the most well-known Christian leaders in the English-speaking world of the 18th century. They struggled with each other regarding some significant points of Christian doctrine, and through their dialogue they introduced the notion of “agreeing to disagree” into Christian discourse. 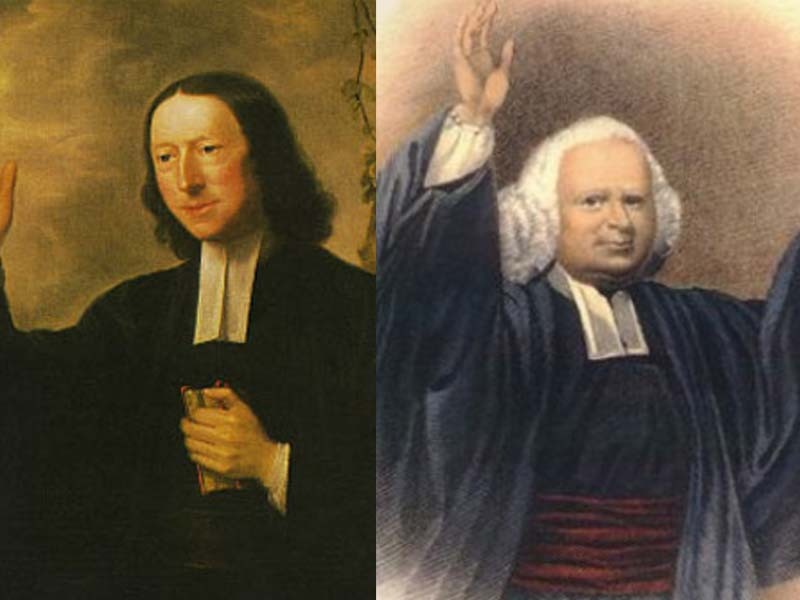 In 18th century England and America, two of the most celebrated figures were George Whitefield and John Wesley. Whitefield and Wesley would travel up and down the American Eastern seaboard and across the British Isles preaching in the open air. The first “Great Awakening” can largely be attributed to how God used these two men to lead many thousands into a relationship with Jesus Christ, perhaps one of the greatest spiritual revivals in the history of the church. But Whitefield and Wesley had some rough spots in their relationship with one another. In one important matter, they differed in terms of some significant Christian doctrine. George Whitefield, a Calvinist theologically, believed that when Jesus Christ died on the cross, He died only for the elect who would come to know Christ. If you were not among the predestined elect, Whitefield concluded that the Bible taught that Jesus had not died for you. John Wesley, an Arminian theologically, vehemently rejected this teaching. For Wesley, Jesus Christ died for all of humanity, whether someone received Christ or not. Though these men clearly differed on the extent of Christ’s atoning work on the cross and how that related to predestination, they were united in many more things in terms of doctrine than over that which they were divided. Since that remarkable sermon, Christians over the years have recalled Wesley’s words that he at times exchanged with his colleague Whitefield about “agreeing to disagree.” Though these men still had their points of conflict, in the end, they were able to consider each other not as enemies but rather as friends, as brothers in Christ, despite their disputes over some points of doctrine. It is a lesson that the evangelical church today still needs to hear. The principle of “agreeing to disagree” over significant yet secondary matters has helped the evangelical movement maintain some sense of cohesion over the centuries. But it has not always been easy. Consider the controversy regarding different understandings of the doctrine of creation. As we have covered before here on Veracity, there are three main camps among evangelical Christians with diverse views regarding how God went about the work of creation. Young Earth Creationists espouse the traditional view, that the world was created in six literal 24-hour periods. On the other end of the spectrum, Evolutionary Creationists believe that modern science has effectively shown that God created the world, including humans, through an evolutionary mechanism. As a mediating perspective, Old Earth Creationists accept that while the earth was created over six long periods of time; nevertheless, humanity was created through a special supernatural act with no antecedent biological connection to other life forms. Each view claims that their view is supported by and consistent with a high view of biblical authority (You can read about the beliefs held by some of the major evangelical “creationist” organizations here: Answers In Genesis, representing one approach to Young Earth Creationism; Reasons To Believe, representing Old Earth Creationism; and BioLogos, representing Evolutionary Creationism). But my complete aversion to that position eventually softened. About ten years ago I swallowed my pride, repented of my hard-heartedness, and made an effort to re-examine Young Earth beliefs and have conversations with people who were persuaded by such arguments, seeking to understand some of the better arguments for their case. Here on Veracity, along with John we have done our best to present these arguments in a respectful and accurate manner, urging the reader to evaluate the evidence in light of the teaching of Scripture for themselves, and make their own decision. Here on Veracity we do not endeavor to tell you what to think, but nevertheless, we do encourage you to think. This has been a bitter pill for me to swallow. Like many people, I have a felt need to be right! In my zeal for the upholding the truth, I had forgotten that I need to uphold that truth in love (Ephesians 4:15) Young Earth people now are no longer idiots in my mind, but rather they can still be partners in the Gospel, despite our differences. Some of my closest and dearest friends and family do not share my views on creation, but I am nevertheless glad to call them as my brothers and sisters in Christ. I am privileged to labor in the Lord alongside other believers, learning from them as we worship together, despite our various views on interpreting Genesis. Furthermore, I am also willing now to accept the idea that I could be wrong about the age of the earth. If it turns out that the earth is less than 6000 years old, and that is how God purposed things, then so be it. May God be praised! I will still have some questions as to why God gave us overwhelming scientific evidence in creation pointing to a 4.54 billion year old earth. It seems inconsistent with God’s character that He would reveal one thing in creation and then reveal something entirely different in the Bible. Nevertheless, I do not see things entirely from God’s perspective. I do not have the full picture (and probably neither do you!). This is God’s creation, and He does not need my input as to what He can and can not do. In the end, I can still give Him all the honor and glory, whether we are talking about 6000 years or 4.54 billion years. It really grieves me when Christian ministry leaders will publicly characterize other believers who disagree with them on their views of creation as being like Sanballat and Geshem, the enemies of Nehemiah (see Nehemiah 6), as was done recently (UPDATE: July, 2015: Originally, I gave links to other sites documenting this controversy, but I have since decided not to publish these links anymore as I no longer think this would be very edifying). Folks, we can do better. Let me be crystal clear on this: It does not matter if you are a Young Earth Creationist, an Old Earth Creationist, or an Evolutionary Creationist. We are all called as believers to be ambassadors for Christ. When we unfairly attack our fellow Christians as being “compromisers” are we not compromising that calling to be ambassadors for that Gospel? When we treat the other Christian as “the enemy,” we do great harm to the cause of the Gospel. Let me offer an encouraging contrast. About this time last year, our church held a symposium on creation. At one point I asked some 200 participants to raise their hands to get a rough idea as to how our community views creation as taught in the Bible. About one-third of the room declared themselves to be Young Earth Creationists. Another one-half declared themselves to be Old Earth Creationists. Some 10% of the room raised their hands as being Evolutionary Creationists, while the others were undecided. What I find remarkable in our community of faith is that even though there is not unanimity regarding the particulars of how to interpret the Bible on this issue, nevertheless, our community has decided that we will not allow differences on this issue to divide us and keep us from having fellowship with one another. I am so thankful to be a part of a community that seeks to major on the majors and minor on the minors. Does “agreeing to disagree” have its limitations? It all depends on whether the issue at hand is regarded in some sense as a “salvation issue,” something that would require a break in fellowship. Granted, these type of disputes can make people feel very weary. Some would prefer to simply sweep these kind of discussions under the rug. But while there should be times where we can set our differences aside and focus on what we share in common, we do not really learn how to love the other if we simply pretend that these differences do not exist. Instead let us make the effort to better understand other points of view, thereby upholding the truth in love, seeking to be ambassadors for Christ, while agreeing to disagree when necessary. This entry was posted on Monday, October 27th, 2014 at 7:07 pm	and tagged with Creationism, Evolution, Genesis, george whitefield, john wesley, old earth, young earth and posted in Apologetics, Witnesses. You can follow any responses to this entry through the RSS 2.0 feed. Clark I could not agree with you more completely. Although I believe the Scripture is inerrant, because God is inerrant, we, the readers, are 100% errant. We all should humble ourselves, and recognize we can be wrong. I agree we should love people we disagree with. Imagine the surprises we will see in heaven. Well put, Woody. Thanks for your feedback! The vitriol extended by stubborn, prideful people who think their limited and exclusive interpretations of Scripture are correct, and that Christianity will fall apart if interpreted differently, is tragically sad. We are indeed commanded to contend for the faith…”with gentleness and respect” (1 Peter 3:15). The apostle Paul wrote in 1 Thessalonians 5:15 that we are to “try to be kind to each other, and to everyone else.” Christianity is a war fought with kindness, gentleness, and respect–it is not a crusade to promote interpretations. Is that wall that Ken Ham is working on so diligently intended to keep people out or in? Fortunately, reason and truth point to the same Savior. Great post, and what a beautiful example of humility! As a former old earth geologist who faced many of the same struggles that you did, I have come to believe that faith and reason both point to a young age of the earth, but I certainly believe that it is not unreasonable to believe in an old age. In science, there is data, and then there is interpretation of that data. How many times have we seen scientists backtrack on their findings? For example, look at all the different foods that at one time were supposed to be healthy, and now are no longer considered so healthy. Did the data change upon which the scientists based their conclusions? No, it was the revelation of more data that caused a change in interpretation. To point to an example from geology, at the turn of the 20th century, all geologists were convinced that geological processes were extremely slow and gradual, because they looked at what they saw around them and assumed that was how things always had been–the principle of uniformity. Then J Harlan Bretz started exploring the channeled scablands of Washington state and realized it could only have been carved by a massive flood. It took decades, and most of those who initially disbelieved him never changed their minds, but all geologists now acknowledge the existence of catastrophic floods far beyond those we see occurring now. In terms of absolute dating of rocks, geologists use radiometric “clocks” to assign dates to rocks, but what we’re finding now is that some clocks are conflicting in a radical manner. For example, C-14, which is supposed to be found only in materials less than about 50,000 years old, has been found in dinosaur bones dated by other clocks to be closer to 60,000,000 years. Preserved biological materials which are not supposed to have survived more than one or two million years at the absolute most, have been found in fossils dated to the hundreds of millions of years by other clocks! What are we supposed to do when two lines of evidence conflict so radically? I suggest that at the very least, we have to consider that the radiometric clocks which give ages of millions or billions of years of age cannot be considered unequivocal proof beyond debate, because of the conflicts with other dating methods. S.M., Thank you for your comment. It reflects the spirit of what I believe is most important in the debate regarding earth’s origins. As to the arguments you bring up, thank you for pointing out J. Harlan Bretz and his insistence that uniformitarianism need not preclude catastrophic flooding. Prior to Bretz, the adherence to a strict uniformitarianism shows us now that science can and indeed does change. This is also highlighted through the discovery you mention of dinosaur “blood” by Mary Schweitzer. I am not a geologist, but I defer to those like Mary Schweitzer, who though remaining puzzled by such anomalies, nevertheless finds that the scientific consensus regarding the age of the earth is a reasonable conclusion, consistent with the essentials of Christian faith. There is always the theoretical possibility that a completely different explanation for such anomalies could be correct; thereby supporting a young earth, but for now it still appears that the most probable explanation supporting an old earth is the right one. guidance. You have done a good job of encouraging such interaction. As a professional biologist called to be a witness for Christ on a secular campus, I pray that God will use this post to be of help to many. Thanks for being a model for me on how to love God through the Scriptures as well as loving God through his Creation!